1. 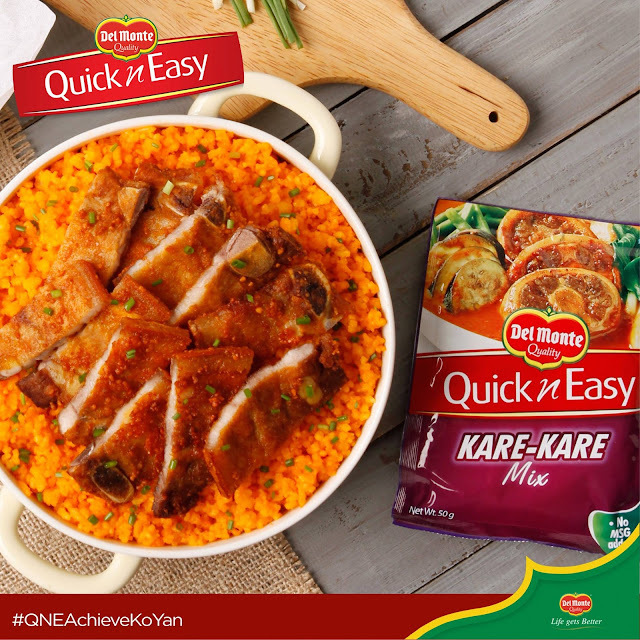 Rub pork slices with DEL MONTE Kare-Kare Mix. Let stand for 10 minutes. 2. Heat pan with oil. Season pork with salt. Fry pork slices in medium heat until golden brown. Cut into strips. Set aside. 3. In the same pan, saute' garlic, ginger, bagoong, sitaw and half of green onions for 3 minutes. 4. Add remaining kare-kare mix and water. Cover and simmer for 2 minutes. 5. Add rice and pork slices. Cook with continuous stirring for 2 minutes or until well blended. 6. Top rice with remaining green onions.